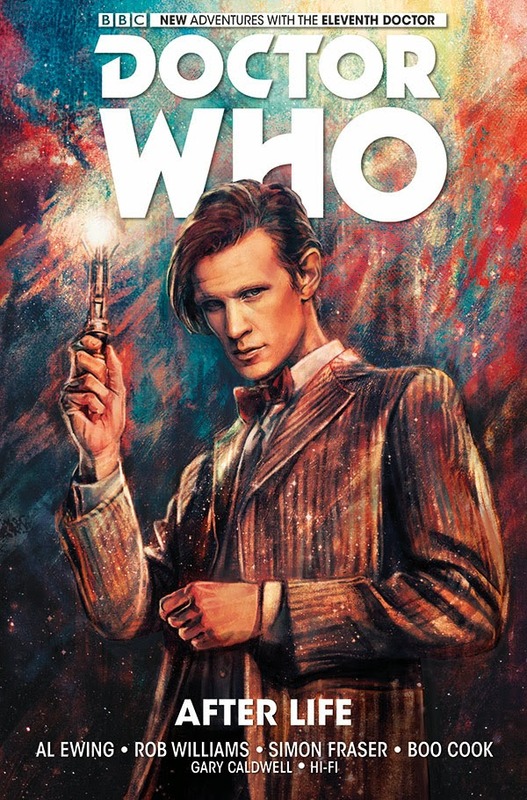 In Conversation With Al Ewing, Author of Doctor Who: The Eleventh Doctor Vol. 1 After Life | Warped Factor - Words in the Key of Geek. 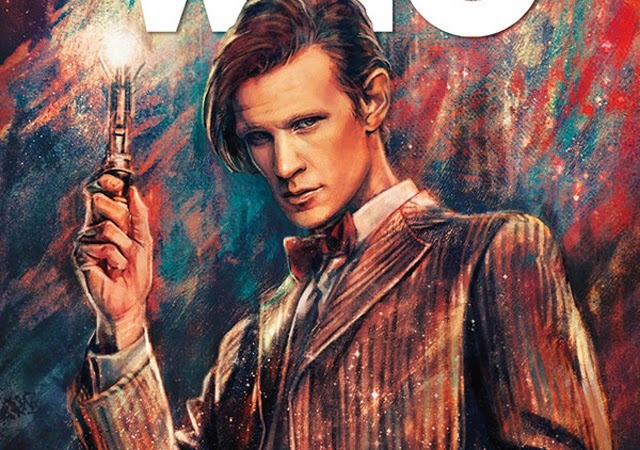 Tony Fyler talks to Al Ewing, author of the new Eleventh Doctor graphic novel After Life. Hi Al. What has been your most challenging project to date, and what made it challenging? Every project seems more challenging than the last, if I'm honest. Doctor Who's been quite tough to write, because in addition to all the other difficulties of writing, you've got to get the tone of Matt Smith's performance captured without movement or sound. Aside from that, probably the most challenging thing is when I'm writing from an agreed plot - as in, one I've sent in and had approved - and I realise there's a giant hole in it, and I can't go back because the first episodes have already been drawn, so then I have to do a few contortions and fix it as we go. That's always tough, but sometimes creating that solution produces nuggets of gold to use later. It’s been said that you’ve perfectly captured tone of the Eleventh Doctor’s era, even for those people who didn’t know the era HAD a tone. What do YOU think that tone is? That tone is Matt Smith! His acting, his delivery, the lines that were written specifically for him. If you can nail that, you've got it. Everything else - cold opens, done-in-one episodes - can be simulated with the format. Apparently there are some thematic resonances as well, but that might be more luck than judgement on our part - we were in the happy position of just coming off the Eleventh Doctor's tenure when we wrote this, which means that all the timey-wimey stuff and the other themes were fresh in our subconscious minds. If we'd been writing, say, the Sixth Doctor, we'd have had to go back and watch a few and work out what the common factors were, instead of just going on instinct. There’s a particular challenge in writing for the Eleventh Doctor, in that people expect long, complicated, Moffaty series arcs from him. How difficult has that been to deliver in terms of the time-twisting? Have you thought “This will be the Robert Johnson episode, this will be the theme park episode,” etc? How closely have you had to plot the arc? And how does that compare to, say, the plotting of your 200AD work, or indeed your novels? We went in, to start with, with the idea of doing a very complex, timey-wimey plot - we'd been brought in on the strength of Trifecta, the Dredd crossover we did with Si Spurrier and various brilliant artists, and that was very twisty and turny as well. Actually, at the very early stages, Si was part of the process - he had to drop out due to work commitments, but it was going to be the old team together again. So that was the skeleton we hung stuff on, the big arc of the series. And then we divided it up in terms of who'd do what and where - dividing up one-parters, two-parters we'd do all of, two-parters we'd each do one half of, single issues we'd do half each of, etc... and once we'd done that, and decided where the beats would be in the structure with regard to the big arc, we could think about "well, I'd like to do a historical, I'd like to do a base-under-siege story, etc, etc". So we went in with this big plan, and then during the actual writing of the thing it warped into something completely different and much better, as is always the way. You’ve managed to capture the Eleventh Doctor’s dialogue well – are you a Who fan? If so, who was your Doctor? I am a Who fan of long standing! My Doctor was probably Peter Davison - I'm on the cusp between him and Colin Baker, I think - but my favourite Doctor is Patrick Troughton, who was just brilliant. Maybe it's the fact that most of his episodes are lost - I did love him doing double duty in Enemy Of The World when that turned up. Have you had to learn Smith’s style of delivery for this job, or did you know it before you came to the project? I knew it from the episodes, but while writing I keep an episode from Season Five loaded up in iTunes, so I can refer back to it and get the intonation while I write. You’ve filled the Eleventh Doctor’s Tardis up with new companions – were they your idea or were they part of the brief from Titan? To what extent have you been able to choose and shape them, and what have you sought to bring this batch of companions that we haven’t seen from the Eleventh Doctor’s companions before? The brief from Titan was 'new companions' - beyond that, we were free to shape them as we wanted. We called them 'A', 'B' and 'C' to begin with - 'A' became Alice, and she was our main companion from the off. Rob had an idea of bringing in David Bowie, but as a very young Bowie who wasn't Bowie yet, which became Jones. And I wanted to do a companion who was completely alien, who was a little strange and dangerous and you wouldn't know how it was thinking, and that morphed into ARC. So we were trying to do things the TV series hadn't or couldn't - ARC, for example, couldn't be done well without draining away most of the SFX budget for the show. There’s a sense that the ServeYouInc storyline is building to a crescendo – how many more episodes can we look forward to in this storyline? And are you going to continue to write Eleventh Doctor stories once it’s over? (Will you need a nice lie-down in a dark room afterwards?) If so, anything you can tell us about what’s in store for the Eleventh Doctor in his next adventure? One thing I've learned is not to talk about the future until it arrives - but I can say that the first major arc, the first 'season' if you like, will go until issue #15, and that'll tie up the ServeYouINC story in a way that's hopefully ultimately satisfying. After that... Who knows? For further information visit Titan Comics.